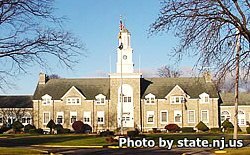 Mountainview Youth Correctional Facility is located in Annandale New Jersey, part of Hunterdon County. It houses over 1,150 youthful offenders some of which are juveniles. Offenders in the low medium and minimum custody are housed in a dorm like setting. A separate single cell unit exists at this facility for inmates housed on a temporary maximum custody status. All offenders are required to obtain a GED if they do not have a high school diploma, or they must take vocational training. Treatment programs at Mountainview Youth Correctional Facility include Alcoholics and Narcotics Anonymous. Offenders can work on a dairy farm located on institutional grounds. Additionally, selected inmates provide highway cleanup duty to the surrounding area. The date and time of visitation will depend on which unit the inmate is currently in. Inmates are allowed a maximum of three visitors at a time. Saturdays and Sundays (alternating high and low dorms, call for current rotation) from 9am-11am (registration is from 8am-8:45am). Saturdays and Sundays from 9:30am-12:30pm (registration is from 9:15am-12pm). Saturdays and Sundays from 10am-1pm (registration is from 9:30am-10:30am).